Pope Francis arrived in Abu Dhabi on Sunday to begin a three-day visit to the Arabian Peninsula. The Pope’s trip to the Arabian Peninsula is historic; he is the first Pontiff to visit the birthplace of Islam. The Associated Press reported that Pope Francis is seeking to turn the page in Christian-Muslim relations. Pope Francis will also hold a giant Mass on Tuesday which is expected to draw 135,000 people in what many are calling the largest show of Christian worship on the Arabian Peninsula ever. 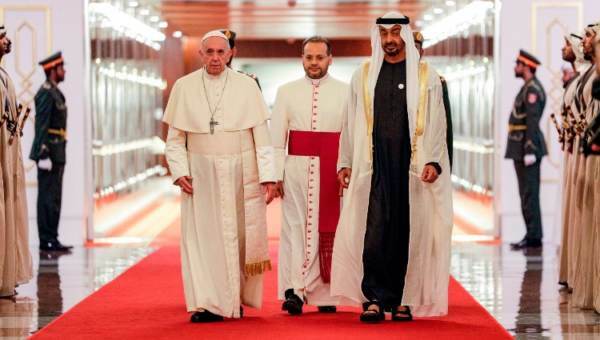 Pope Francis has arrived in Abu Dhabi where he was met by Crown Prince Sheikh Mohammed bin Zayed Al-Nahyan. This is the first ever papal visit to the Arabian peninsula. The post JUST IN: Pope Francis Arrives in Abu Dhabi – First Pontiff to Visit Birthplace of Islam appeared first on The Gateway Pundit.